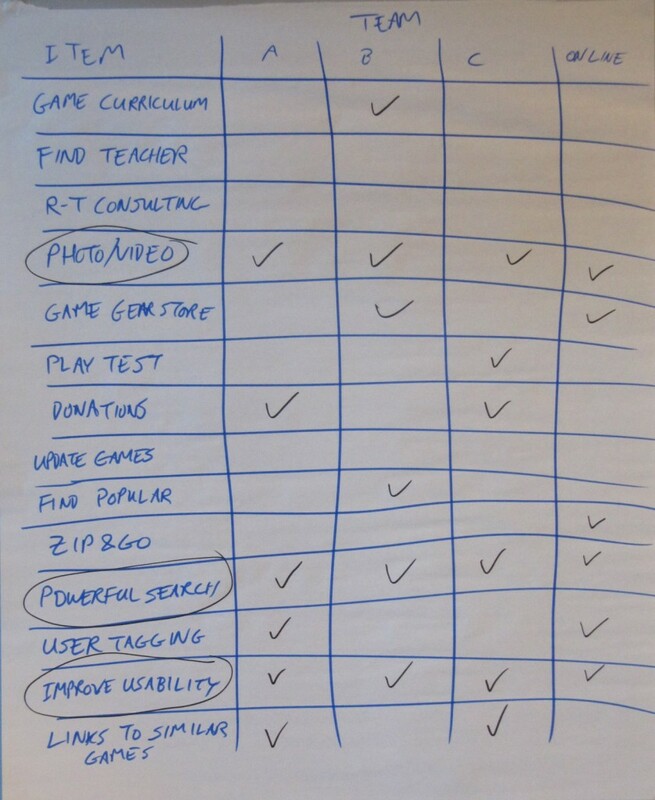 At Agile Games 2011 in Boston (not to be confused with the other Agile Games conference – Play4Agile in Germany), yours truly got to act as the Product Owner for TastyCupcakes.org and get community input on what features we need to develop. On the one hand, this is a case study for running InnovationGames® and on the other hand we’d like to hear from you about some of the proposed features. Since this was a last-minute deep-dive session to cover off a medical emergency, we had very little time for prep. As a result, we played Prune the Product tree in open-ended exploration mode where there were initially the tree was empty of items – it was up to the players to decide what was important for game designers and game seekers at various time horizons. As the session was going on, we noticed the teams were really cooking. Luke said “I thought we were just doing a demo, but there is some really valuable product information.” I (the smart alec) said: “Innovation Games works! Who knew?” IMHO, it is just so cool that it is like magic. It was at that moment that we realized and lamented that we did not ask for volunteers to be observers. Important lesson: use and train observers! Happilly, I was able to benefit from this lesson the very next day when I ran a surprise session on Innovation Games with Brian Bozzutto and Johnny Scarborough, but that’s another story and will be told at another time. During the morning session, I identified features and sized them (S, M, L). Over lunch, Luke and I (actually mostly Luke) created and printed features lists and descriptions. Of course, this was done in excel so we could upload directly into buy-a-feature online game. Check out this PDF of the Tasty Cupcakes Feature Buying Guide. Caveat: in a real Innovation Game, it would take time to unpack all the observations and create a list of features. We did it over lunch as a demonstration. If you are doing real work, take the time to get the feature list right. We played three in-person buy a feature games and one online game. The results of all the games are show below. What does this show us? It shows us that there is a strong consensus for the top features – these were selected by all groups: photo/video, powerful search, and improve usability. One would need to unpack obeservers’ notes to understand other features. For example, one group assumed that user tagging would have to be included in powerful search and did not buy it. Does these features make sense to you in terms of TastyCupcakes priorities? Please let us know.